In December last year, David Cameron announced that it was: “simply a waste to have a health service like the NHS and not use the data it generated. Let me be clear, this does not threaten privacy”, he reassured us, “it doesn’t mean anyone can look at your health records, but it does mean using anonymous data to make new medical breakthroughs”. Cameron often inadvertently signposts the coming of a diabolical lie with the phrase “let me be clear”, as we know. We also know that so-called anonymisation of data offers no protection at all to identities and personal details. 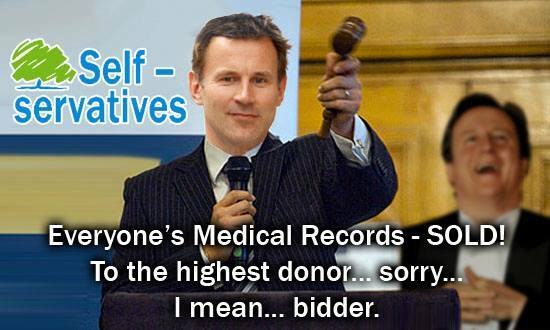 Campaigners described the plan as an “unprecedented threat” to confidentiality, Health Secretary Jeremy Hunt says, rather worryingly, that it will be aboon to research. ← Why is the Labour Party in bed with a RIGHT-wing thinktank?